This post was written on Saturday, but, thanks to the wonder of post scheduling, is appearing on Sunday: technically the last day of week 51 and the last day I woke up in Edinburgh. Hence the goose egg for Sunday. Apart from the occasional post on my travel blog and an email here or there, it's going to be goose eggs all the way to April 2009. No fiction. No poetry. No rambling blog posts about Muriel Spark or The National. I don't know if I can go cold turkey. 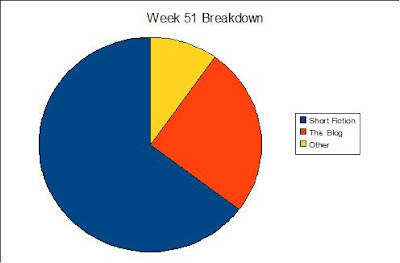 Week 51 was quite a come down from the record-breaking of its predecessor. Too many errands to perform. Too many people to catch up with one last time. Too many things I never got around to fighting for my attention. Seems a shame to end 2008 on a downer, writing-wise. But hey, I made it to 800,000 words. That's 80% of a million words. Or 2,188 words per day. 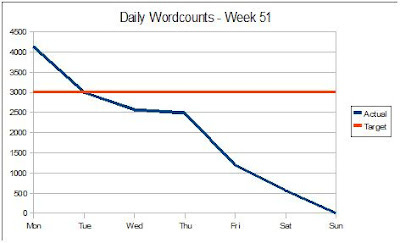 If you take out the 46 days (past and future) in 2008 when I was unable to write due to being outside the UK, the average becomes 2,502 words per day. But I'll hold back on further number crunching until my graph extravaganza. 800,000 words is a damn fine achievement. Aim for the stars and you might hit the moon and all that, eh?